In the midst of the troubling events from Charlottesville and its aftermath dominating our news, we should pause to reflect on our personal and collective responses. As a church we are a body, a sanctuary, a place where we find spiritual nourishment, soul repair, and hear the call to love and action. On our own, we might feel unequipped, ill-prepared, or even lost on how to begin to stand for justice, equality, and peace. As your Pastors, we want to reach out to offer prayerful words of encouragement and remind you that you are not alone in this journey. We have God who created us, declared us good, and sent us Jesus Christ our Lord to model how we embody God’s Love in our world. You have this supportive community that stands for justice, loves without hesitation, and respects all human life and treats all with dignity and compassion. Following the events of Charlottesville, the Presbyterian Church (U.S.A) made a strong statement denouncing racism, white supremacy, and all groups that align themselves with such evil. Upon reading this statement, the Session of Second Presbyterian Church voted unanimously to endorse this statement and vowed to bring these words to actions. As Pastors, we are proud of this response and we vow to prayerfully stand by this endorsement and challenge ourselves and one another to put our faith into action. We are asking each of you to consider: how will I respond? In addition to the statement provided by the General Assembly, the elected leaders of Baltimore Presbytery also issued a statement declaring intolerance to any rhetoric that speaks of discrimination, hate, or violence. Both these statements remind us that our words matter, our responses matter. 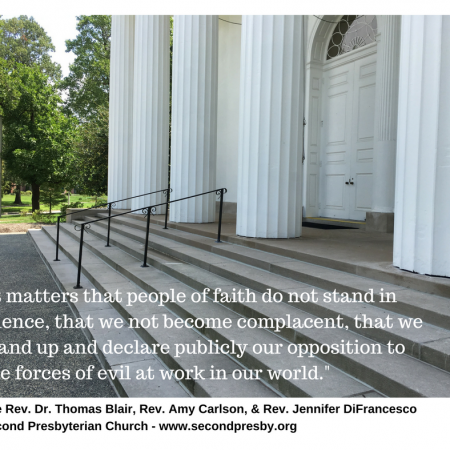 It matters that people of faith do not stand in silence, that we not become complacent, that we stand up and declare publicly our opposition to the forces of evil at work in our world. Please take care of yourselves through these times. Make space for silence and prayer. Make space for all of the love and good in our lives. Pay attention to all that is going on inside of you. Grieve, but allow for healing. If we are to be successful in our response, it must be from a place of healthy wholeness, and it must be together, as the collective Body of Christ. Please, do not hesitate to reach out to any of your three pastors. We are here to journey with you. Know that we are holding you in prayer with full confidence that you will embody Christ’s love and that you will be the change we are longing for in this world. Blessings,The Rev. Dr. Thomas Blair, Rev. Amy Carlson, and Rev. Jennifer DiFrancesco.